I've uploaded papers sets 4, 5, and 6. I'm a bit worried about Paper Set 6 being a repeat of a pattern I used in another kit. I created this paper pattern using a brush that I designed quite some time ago and I have an odd feeling that I used it for a paper pattern in another kit. If so, hopefully, it doesn't look exactly the same. Thanks for todays additions to the Birds and Blooms kit, papers are lovely and frames are spectacular. These papers are great! Thank you! Re your comment yesterday about packing some things separately so it is easier to add photos - hurrah and thank you! For me, anything that is done to make it easier for things to fit together is very helpful. Thank you so much for this Freebie. I want to let you know that I posted a link to your blog in Creative Busy Hands Scrapbook Freebies Search List, under the Elements or Papers post on Jun. 20, 2009. Thanks again. Hi again. I have been picking up birds and blooms. It is awesome. The kit is just gorgeous. I love all the papers and elements. I love the qp's and the journaling clusters. This is super. Thanks so much for sharing. Thank you. 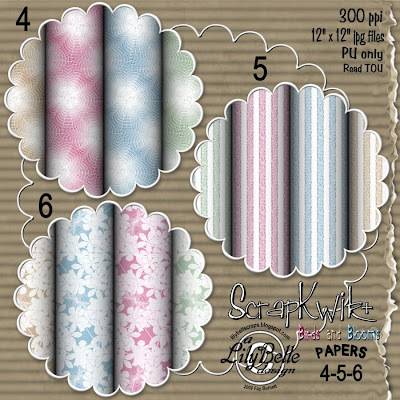 I especially like the flower papers in set 6 (papers 14A-D).